The Super Duty ® 7.3L trucks are one of the easiest trucks to convert to Cummins ® power. No modifications to the firewall, core support, or floor pan are necessary. The stock radiator and intercooler can all be used as is with the Cummins engine, and the fan shroud works with minimal modifications. When you buy Diesel Conversions ® parts we include year specific installation instructions. 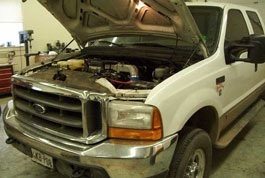 This includes wiring instructions for customers using the 12-Valve 6BT or the 1998½ - 2002 24-Valve Cummins engines, or if you would prefer, you can opt to have us do the bulk of the wiring work for you by sending in your 7.3L engine harness to be modified, as we do with the 2003 and newer Cummins engines. Ford 5-Speed – Diesel Conversions ® makes adapter plates for these transmissions that use the 2003-2007 Ford diesel starter and require no grinding- as long as they were behind a 7.3 diesel. We can also offer adapter plates that use the Dodge ® Cummins starters for the 7.3 diesel or 460 big block 5-speeds. These adapter plates require grinding of the starter pocket for starter to transmission clearance. The 1995 and newer transmissions are rated for 470 ft. / lbs. of torque. Ford 6-Speed – Diesel Conversions ® makes adapter plates for the 7.3 and 6.0L diesel 6-speed. These are very good transmissions for the conversion. Currently, we offer an adapter plate that uses a 2003 - 2007 Ford 6.0L Power Stroke starter for the ZF 6-speed. You will not need to grind your transmission bell housing but will need the correct starter for this application. 4R100 -This is what your truck has now if it is an automatic. It is a 4-speed transmission. If you are planning on doing a lot of heavy pulling or adding a lot of performance upgrades to your engine, you may want to have your transmission built with aftermarket parts. Diesel Conversions® recommends that you have performance upgrades done to this transmission if you will be doing heavy towing or making performance upgrades to the Cummins engine. Diesel Conversions® has two styles of adapter plates available for the diesel version of the 4R100 going to the 1989-2002 Cummins. If you buy yourself a Ford 6.0L diesel starter, you can use the adapter plate that does not require the grinder job on the transmission. This adapter plate uses the stock Dodge Cummins flex plate and torque converter adapters. The adapter plate has to tilt the transmission just 2½ degrees to accommodate the starter without grinding the transmission or starter (although there is a very insignificant rib that needs just a touch of grinding just behind the starter; this small amount of grinding shouldn’t affect any core value of your case and it most certainly will not affect the structural integrity either). If you have a Common Rail Cummins, or just want to use the Cummins starter, you will need to grind the bell housing for starter clearance. The adapter plates for automatic transmissions require our torque converter adapters and use the Dodge flex plate. Manual transmissions require the appropriate Dodge Cummins flywheel. Our adapter plates are built out of aircraft grade (6061) aluminum. This adapter replaces the existing adapter on the Cummins Engine, making a factory quality connection between the engine and the Ford transmission. Our motor mounts are pre-drilled to accommodate for the stock engine fan (recommended). Because the Cummins engines are longer, your transmission and transmission cross member must be moved back 2” to 3”. Automatic transmission equipped trucks already have the holes in the frame to accomodate this move. The engine mounts are an excellent design with a bolt going all the way through the polyurethane isolator, instead of relying on rubber and weak interlocking tabs to secure them to the frame cross member. In some cases the front drive shaft on four-wheel drives will stretch enough to reach the front differential. Bushing kits include adapters to put your Ford gauge sending units into the Cummins engine. Most trucks of these years require custom pieces for this, so they are quite helpful. We offer an alternator mount that allows you to use the 7.3 alternator if you would like. The advantages of using this alternator is that your indicator light will still work as it should if your charging system should fail. If you would rather use the Dodge Cummins alternator, we can provide you with an external voltage regulator. Common Rail applications do not need the external regulator. Providing this signal to your Ford PCM computer also is necessary for the air conditioning, transmission temperature, and other gauges to function properly. All 7.3L trucks require the tach ring that bolts onto the front of the Cummins crankshaft balancer for the sensor to send the correct signal pulse to the Ford PCM which makes the tachometer work. DCS highly recommends the US Shift- Quick 4 transmission control module. Read our Automatic Transmission Controller article for more information. Our air filter kit includes a Brute Force air filter; pipe, and hose to connect to your turbocharger. We offer two styles of air filter kits. The kit the 7.3 liter truck will most likely use DCS Part #1942. It requires relocating the passenger side battery to the driver’s side. This takes some fabricating skill to make the brackets to mount the passenger side battery tray and another one just like it on the driver’s side, but it provides a nice roomy area for the air filter, and allows you to keep the degas (radiator fill tank) in its stock location. Even if you buy everything Diesel Conversions ® sells, you will need to come up with a few parts on your own, such as an exhaust down pipe (usually a Dodge down pipe can be a good start), and intercooler tubes (again Dodge stuff can be a good start). Automatic transmission equipped trucks will require a throttle position sensor. Depending on the year and what transmission your Cummins engine had on it originally, you may need to purchase a throttle position sensor, or look into other options. All 24-Valve engines already have a throttle position sensor that can be used for the transmission controller. See Cummins Engine Information for more information.